By 1900, the threats to Britain’s supremacy at the head of the Persian Gulf had grown serious enough for a permanent British representative to be established at Kuwait. Accordingly, Captain S.G. Knox, selected from the Indian Political Service, arrived as the first political agent in 1904, reporting to the resident at Bushire. The Sheikh, Mubarak Al Sabah, found for him to lease at low rent a well positioned house overlooking the busy foreshore, belonging to a Jasim Al Asfur. Knox, hoping that this need only be a temporary solution, argued for urgent repairs and additions, including the adjacent plot for stables, and this work was completed over the following year or two. The result was an adequate agency that became a prominent local landmark, with its tidy white appearance, curved double stair up to the veranda and a tall flagstaff in front. The ground floor housed the offices and a suitable room for receiving sheikhs and merchants, and the agent lived on the first floor. By 1917 the building had deteriorated seriously and the agent of the day suggested building anew elsewhere. Nobody was listening, and so make-shift repairs were done to enable the building to stagger on but the mud walls were often weak with damp and the roof was a sieve. One agent decamped for a couple of years to the old quarantine building at Shuwaikh. Lt.Col. H(arold). R. P. Dickson was appointed agent in 1929 and, with wife Violet and two small children, had even more reasons than his predecessors to seek a better agency building. Telegrams in March 1929 reported ‘… as a result of recent heavy rains a large portion of the Agency spare room verandah collapsed last night….and room is now uninhabitable’ and, two days later, ‘the rest of spare room verandah collapsed last night. Agency now left with only one bedroom.’ It was little comfort that by this time the Sheikh had acquired the building from the Al Asfur family and was leasing it rent-free to the agency. The Dicksons put in hand such repairs as they could through a helpful Persian contractor called Usta Ahmad while pressing Calcutta hard, through the resident in Bushire, for money for a new building. Dickson briefed the Bushire residency engineer to propose a design for a new agency. He thought it particularly important to have a downstairs receiving room. ‘The Sheikh calls usually twice every week throughout the year, and it is awkward as well as undesirable to have to take him and his entourage every time up to one’s private apartments and hide away one’s family in another part of the house, this is especially so as his visits usually last as long as an hour and a half.’ Verandas were used as living rooms during the summer, especially in the damp season. 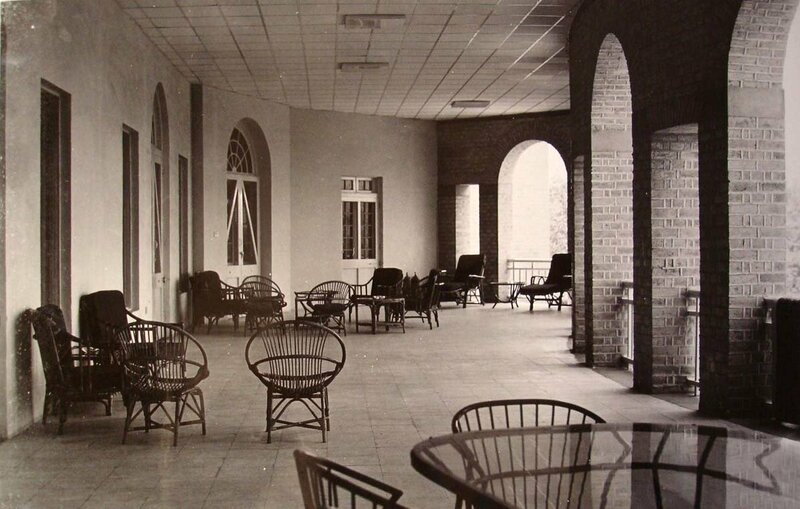 ‘I know of no verandahs in the Gulf less than 14ft in width, many are twice as broad.’ The drawings were sent to Calcutta but the proposal became bogged down in the bureaucracy. In 1930, a mighty cloudburst flooded and further damaged the agency building and, thanks to a heated appeal by the resident at Bushire, officialdom in Calcutta and London at last took serious notice. This resulted in the Dicksons eventually moving into a fine new building in 1935. The medical officer moved into the former agency soon after the Dicksons moved out. It had evidently been strengthened and improved with the additional expertise and labour available while the new building was under construction. Dickson retired as agent in 1936 after living in his fine creation for only a little over a year. He soon afterwards became the chief local representative of the Kuwait Oil Company and matters were so arranged with the Sheikh that he returned as tenant to the former agency building, where he lived until his death in 1959. Violet, Dame Violet from 1976, stayed on until evacuation to England, aged 94 and in poor health, in 1990 when Iraq invaded Kuwait. With the exception of the year she lived in the second agency building, she had lived in the first for over sixty years. The Iraqis looted and burned the building during their invasion but it was restored by the Kuwaiti authorities in 2000 and is now a cultural centre fittingly called Dickson House. Fittingly, too, the bodies of Harold and Violet today lie side by side in a grave in the embassy compound. 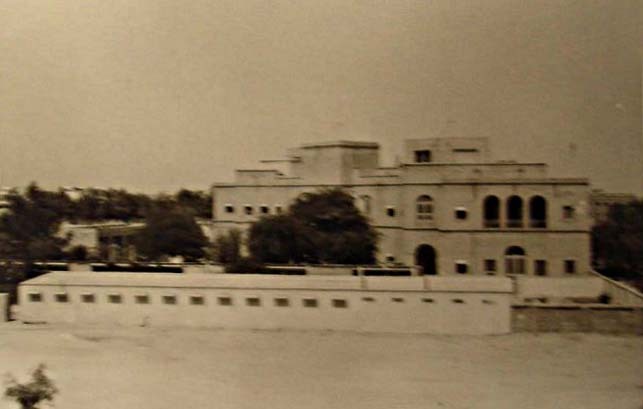 In 1930, and in response to Kuwait’s pleas, the Government of India and the British Treasury each agreed to pay its “moiety” of the costs of a new agency building. 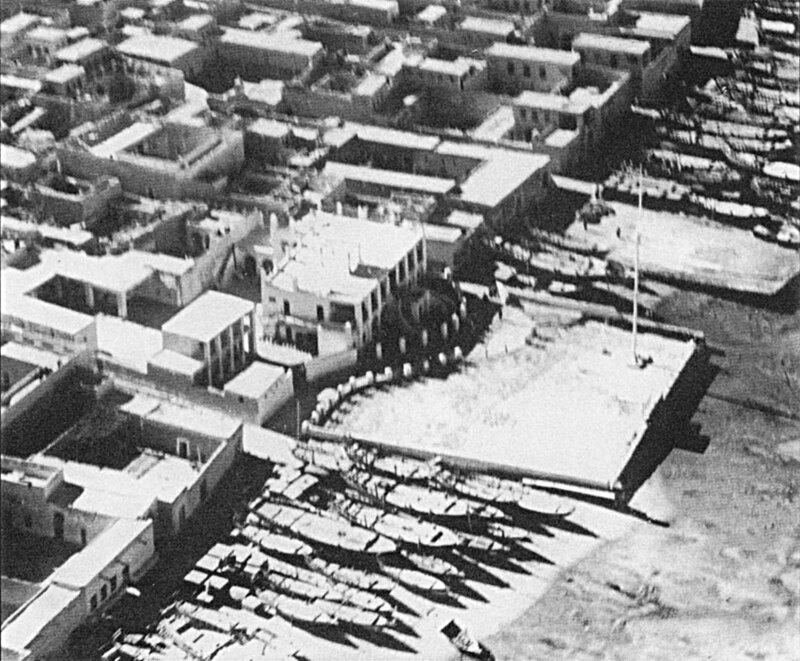 With this reassurance, Dickson approached Sheikh Ahmed in 1931 for a site and was offered one next to the sea at the eastern end of the town. It lay alongside a site already promised to the agency by Sheikh Khaz’al of Mohammera: together, the two sites comprised a rectangle of about 1.5 hectares. Dickson had the foresight to ask for, and Ahmed the generosity to grant, a guarantee in perpetuity that the beach in front of the new agency compound would be kept free of boats and fishing paraphernalia and would not be built upon. Delhi sent the Bushire assistant engineer to survey the new site and to start work on the design, and Dickson in briefing him was not slow to draw upon his own experience of the Gulf. But nothing seemed to happen until May 1931 when Hugh Biscoe, the resident at Bushire, called on Robert Tor Russell, Chief Architect to the Government of India, in Delhi. Russell’s Public Works Department was responsible for designing government buildings, in which programme Kuwait was evidently a low priority. Biscoe successfully persuaded Russell to give the Kuwait project an effective push and, in consequence, outline drawings, signed by Russell, were ready in August 1931. Although Dickson and local advisers were sceptical about some aspects of the design and specification, it was clear to them that Delhi was now in earnest and it might be prudent not to gainsay their proposals. The Treasury was concerned by an increased estimate but did not intervene. Construction started in mid-1932. Good quality burnt bricks were sailed to the site from Amara, on the Euphrates above Basra; teak logs came from India; and furniture for the reception rooms from Maples. The Dicksons moved into the almost completed building in February 1935. There were the usual squabbles over the out-turn cost but the actual exceeding worked out at less than 5%. The building, thanks largely to Dickson’s vigour and eagle eye, was a considerable success from the start and one of the best in the Gulf. It was intelligently orientated to protect from the sun and catch the slight breeze, ingeniously planned to meet both representational and domestic requirements, sturdily built for a long life, and enjoying a huge curved veranda looking out to sea. As in the former building, and elsewhere in the Gulf, the agency offices were on the ground floor and the agent’s entertaining and domestic accommodation on the first. Several changes for Kuwait flowed from Indian partition and independence in 1947. The Foreign Office took over direct control of British missions in the Gulf, and the decision was at last taken to move the residency from Bushire to Bahrain and not to Kuwait. 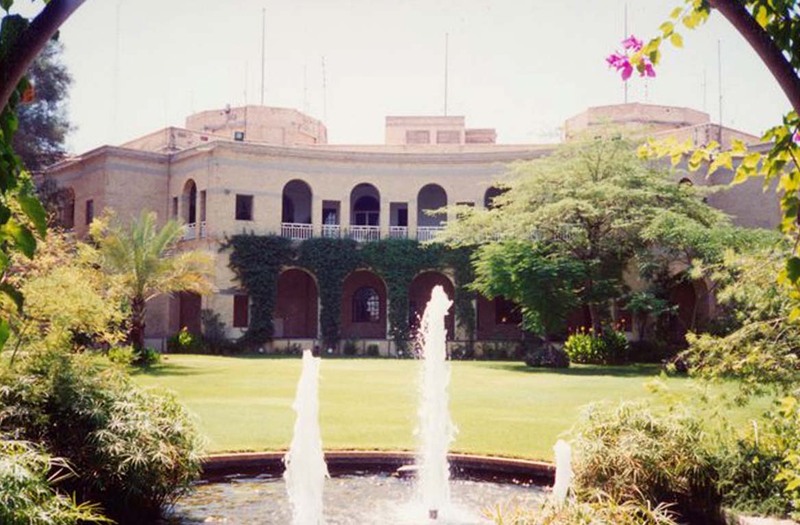 Since the new agency building had been half-funded by the former government of (undivided) India, that government’s interest in the Kuwait property devolved upon the governments of India and Pakistan. Although it was fairly clear from the start that Britain would ‘inherit’ the Kuwait agency property, the tail end of negotiations between the Indian, Pakistani and British governments on a host of Undivided India claims lasted into the 1970s, and delayed certainty on the matter until then. Kuwait gained full independence in 1961 and the agency accordingly became an embassy, and the staff of the mission increased significantly. The offices on the ground floor of the main building became very crowded indeed, and in due course the consular and commercial sections of the embassy moved into leased offices in town. By 1973, they were on the 5th floor of the KIC building. Various schemes were considered in the early 1960s for a residential block for UK staff in the south-west part of the compound. This never happened, largely because the Ministry of Public Building and Works was not prepared to invest in a new building on a site to which (at that time) it did not hold fully secure title. As irrigation water became more available, most of the compound was gradually planted and landscaped, and staff amenities like a swimming pool, tennis court and staff club inserted. (For much of this period the embassy also enjoyed the use of a 2.6 hectare beach hut site at plots 1-5 at Fentas, a few miles to the south.) 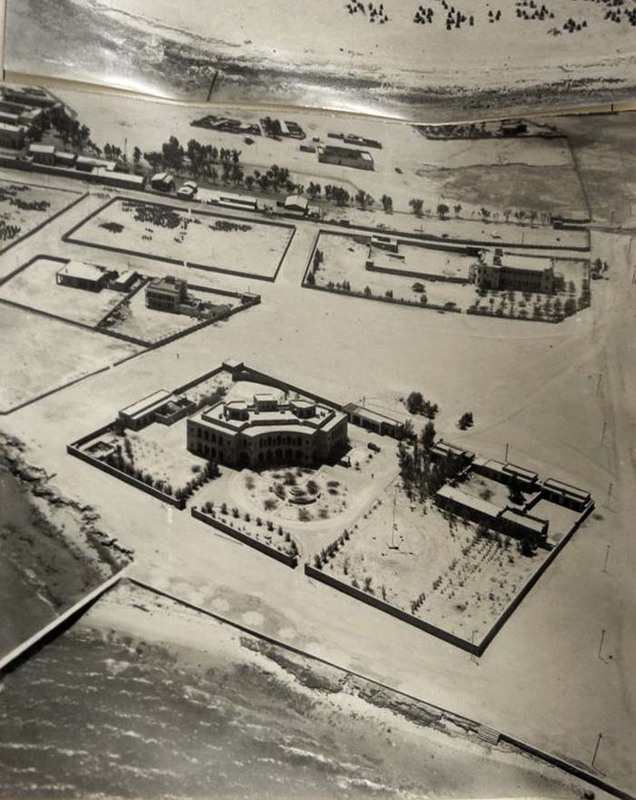 In the 1970s, foreshore land in front of the embassy compound was reclaimed and a corniche road, Arabian Gulf Street, was built with gardens and carparking at the water’s edge but, true to the 1931 agreement, no buildings obscure the view from the veranda to the sea. A new block of offices for consular, commercial and management sections, designed by Ronald Weekes of Percy Thomas Partnership, was completed in 1989 in the south-west of the compound (where the residential block was formerly proposed). HRH Princess Anne unveiled a foundation stone on 18 February 1987 and HRH the Prince of Wales opened the building on 12 March 1989. New servants quarters behind the chancery were built contemporaneously. Proposals for a new British Council building in the north-east corner were abandoned at about that time. The residence was extensively refurbished in 1989, and the landscaping further improved. 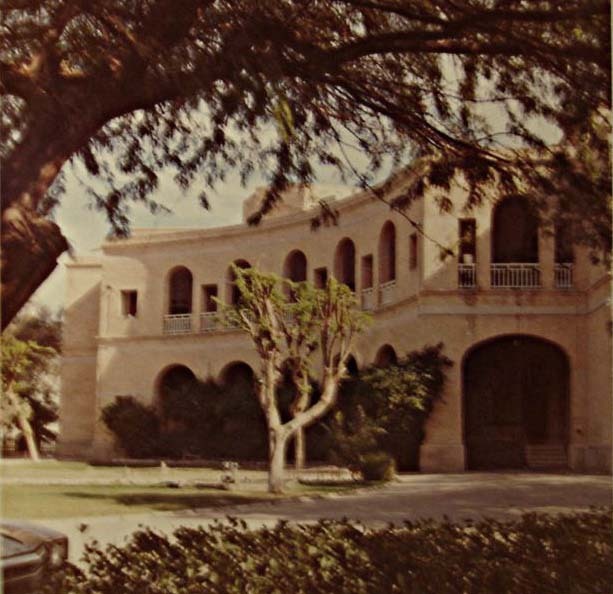 When the Iraqis invaded Kuwait in August 1990, the embassy staff was reduced to four volunteers who lived under effective siege in the compound. They reduced to two, the ambassador and the consul, in October, and they left in December. They returned at the end of February 1991, to find only minor shrapnel damage plus that apparently necessarily done by British forces when liberating the empty embassy. The residence was completely refurnished in 1993. 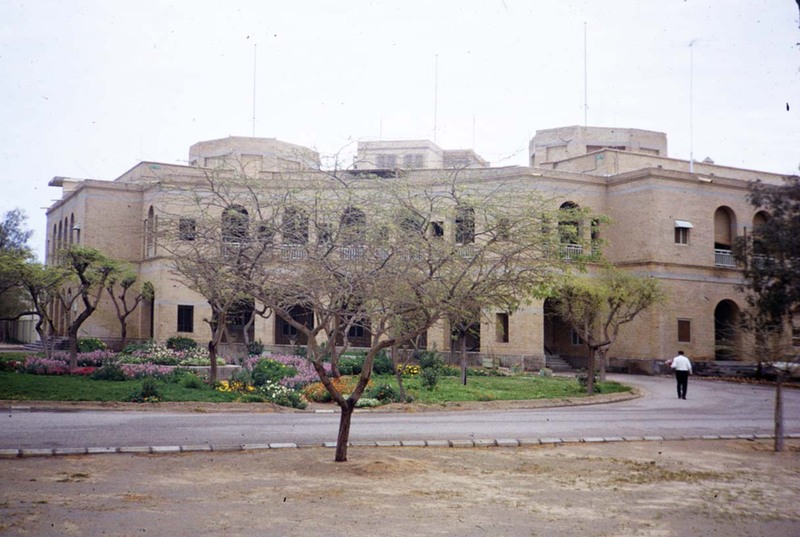 In that year, the FCO also accepted the offer of the gift of a 13 metre wide strip of land alongside the eastern boundary of the compound: the transfer was completed in January 1996. Additional visa offices were constructed beside the 1989 public offices block in time for the introduction of the Common Visa List on 1 April 1996. Former Prime Ministers, Baroness Thatcher of Kesteven and the Rt Hon John Major, planted a tree in the gardens on 25 February 2001 to commemorate the tenth anniversary of Kuwait’s liberation. The exterior of the main building underwent a major renovation, including re-pointing of the brickwork, in 2003. Aerial view of the first agency building, 1928. 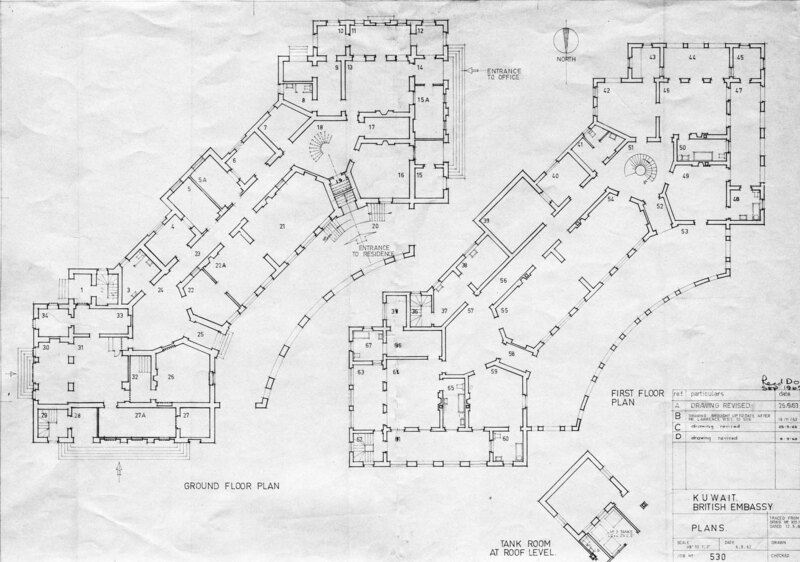 Floorplans of second agency building, 1961 (ground floor on left). Rear of compound, from south-east, 1960s.